Okay, I haven’t officially published the last piece of the Hellcrawl (about 1 more week and it’s live), but I’ve already moved on to … Cush! 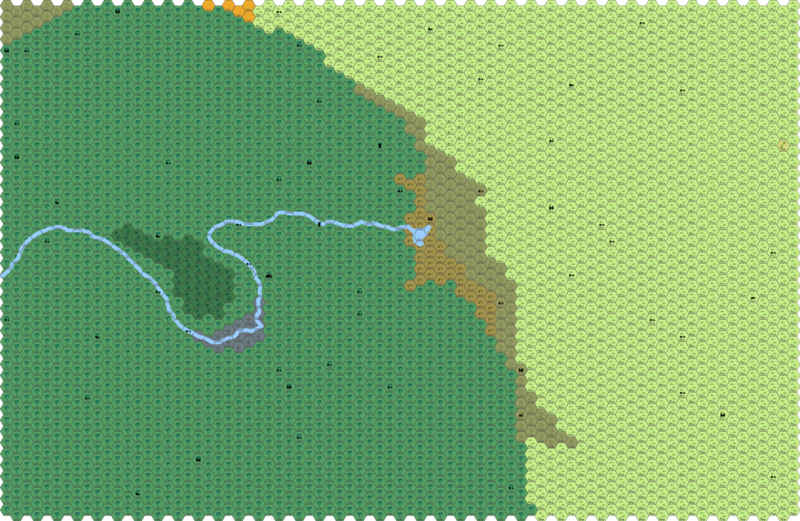 The next hexcrawl project is Cush and Pwenet, pieces of an Africa-themed chunk of Nod. I’m quite excited about this one – probably a good bit of art to commission (which means I’m losing money on this baby), but there isn’t much Africa-themed RPG stuff out there, and it’s a pretty rich vein to mine for adventure. Anyhow – what follows is a quick look at the different geographical regions to be covered and the full Map J12 – the eastern half will be covered in NOD 16, the western half in NOD 18, and NOD 17 will cover the city-state of Ixum. Enjoy! Side Note: I’m now on the hunt for public domain images I can use for the Cush-crawl. This isn’t easy, as much of the pre-1920’s Africa illustrations are either a bit on the racist side (or waaaaay on the racist side) or are a bit dry and boring. If anybody out there knows of some good stuff (I’ll be scouring Wikipedia and Project Gutenberg), let me know. Thanks! During the Pandiluvian Age, the jungle portions of Map J12 were under water, while the Jamba Highlands constituted a chain of islands the connected to the large archipelago of the modern Wyvern Coast. The savanna of Pwenet was a land of salt marshes and grassland. The so-called elder things built small fortresses in these shallow waters to protect their larger cities in the depths. These fortresses were built with a cyclopean, luminous green stones that were fitted without mortar. Although they were hunted for sport, some mermaids established themselves in sea caves and placid island lagoons. When the waters receeded, the swampy grasslands became a savanna and the Cush basin became a dismal, tropical swamp. It was here that the lizard men, former servants of the elder things, established themselves in walled city-states, often surrounding the citadels of their former masters. Humans from the highlands were enslaved and put to work building defenses, for the lizard kings were constantly at war with one another, their society on its inevitable march to savagery. As the waters continued to recede and Cush became a rain forest. The savage lizard men were eventually defeated by the more numerous and clever humans and driven into the coastal swamps or into the underworld. Freed from slavery, the humans established themselves in the homes of their former masters and took up where they left off. But unlike the lizard kings, who spent centuries locked in a stalemate, one human city-state, Kolos, soon brought the others to ruin. Kolos was ruled by an exiled Atlantean who became fascinated with the alien gods of the lizard men, especially the one they called Mictlantecuhtli. Mictlantecuhtli called out to the Atlantean from the Abyss and bound him to his service with dark, unspeakable pacts. In time, the Atlantean, now known as Kolos, would destroy his city-state in a bid for godhood. With Kolos fallen and soon swallowed by the jungles, its tributary port, Zinj, assumed the mantle of leadership in the region. But Zinj was tiny compared to the Kolos, and its interest lied in sea trade, not the fetid jungles. Except for a brief period as a subject of the zebra-striped people of the Zebrides, Zinj has remained an independent kingdom for centuries, even briefly lording it over the purple kings of Ophir after they lost their key trade partner in the invoked destruction of the Nabu. The tribesmen of the savanna land called Pwenet also flourished during the Silver Age. They built villages and towns of adobe and kept massive herds of cattle. They even swept over the Nabu empire and held it for a few decades before decadence and in-fighting aided the Nabu in reclaiming their sovereignty. Map J12 is dominated by a hot, steamy jungle in the west and the rolling grasslands of Pwenet in the east. These two regions are divided by the Jamba Highlands, a small mountain range that feeds the Jamba River. The Adze Marsh runs for many miles along the Jamba River. A powerful necromantic kingdom called Kolos once dominated Cush and made war with the Nabu Empire to the north. While the fall of the Nabu Empire is well documented, the disappearance of Kolos is far more mysterious, and many adventurers have entered the jungles intent on finding that lost city-state and plundering its vaults. To date, none have succeeded in returning to civilization with their lives, let alone any riches. Map J12 has no city-states of its own. The nearest city-states are Zinj (Map I12) and Ophir (Map J11), both coastal ports. It does have a multitude of villages and supports many sentient cultures, including human tribesmen, pygmys, lizardmen and gnolls. The Adze Marsh, named for one of its more dangerous inhabitants is a vast wetland composed of flat lands, lagoons and copses of trees. The area floods in the Spring, hiding much of the flat land and making the entire swamp a virtual lake. The jungle of Cush consists of a gently sloping plain between the Tonaduhna and Jamba Rivers. It is a traditional rain forest. The trees are thick and grow close enough together to blot out the sun. Beneath the canopy live a myriad of insects and reptilian carnivores as well as pygmy deer, elephant, and the dreaded leopard. Cush is valued for its exotic hardwoods (teak, mahogany, ebony and darkwood), orchids and fauna. AMAZONS: The amazons of Cush are related to their more northern cousins. Like their cousins, they live in a matriarchical society. Unlike their cousins, they allow their menfolk to live in their villages and work as craftsmen, farmers and fishermen. Men and amazons live in separate halves of the village. The amazons of Cush wear little or no armor, with the heaviest armored warriors (the nobility and their elites) wearing leather armor cured from the hides of mystical beasts (5% chance of dragonhide leather armor). Cushite amazon warriors carry spears, throwing irons and shields. BERSERKERS: The berserkers of the jungle are cannibals. They appear as normal humans, but with teeth sharpened to points and hungry, feral looks in their eyes. The cannibals of Cush live in small hunting groups of 10 to 20 warriors led by a 3rd to 6th level chief and two 2nd level sub-chiefs. They wear no armor, but 50% of the berserkers carry a shield. Cannibals are armed with nets, battle axes, hand axes or short swords. GHOULS: The ancient city-state of Kolos fell in a cataclysm of dark sorcery, tainting the surrounding land with necromantic energies. Over the next few months the peasants and knights of Kolos, deprived of their city-state, perished. Those who survived did so on the flesh of their fallen neighbors, and thus became ghouls. These ghouls, known for their dull black skin and pot bellies, still haunt the ruins of the jungle basin. They are extremely aggressive (as they’ve been starving for centuries) and are quite resistant to turning (turn as 4 HD undead). About 1% of ruins contain a ghoul able to summon a vrock demon (25% chance of success). TRIBESMEN: The tribesmen of Cush know the secret of working iron and mine and smelt surface deposits from sacred out-croppings guarded by traps and summoned cacodaemons. Their witchdoctors are expert brewers of poison, so most warriors go into combat with poisoned darts (poison I) fired from blowguns. The tribesmen are also privy, it is said, to the location of ancient gold mines secreted deep in the jungle and guarded by forgotten curses and fell magical beasts. Each tribe consists of 3d10 x 10 warriors and additional non-combatants equal to 5 times the number of warriors. For every ten warriors in the tribe there is one “Big Man” with 1d4 character levels, usually in the fighter class. The tribe is ruled by a 6th to 10th level chief and witchdoctor (usually an adept, but 10% chance of being a 4th to 7th level druid or cleric). The chief is accompanied by 1d6+6 2nd level fighter bodyguards. All tribesmen have a very fluid fighting style, giving them a base AC of 11. Tribesmen typically wield spears and blowguns, but might also carry hand axes, short swords, daggers and short bows. Leader types might carry battle axes or long swords. VEGEPYGMIES: These strange plant beings are approximately 3 feet in height with rust-colored skin. They are primitive in nature with a chittering language incompre-hensible to non-plant men. Vegepygmies are usually encountered in small hunting bands. Vegepygmy tribes number from 1d4 x 30. Vegepygmy warriors usually carry spears and throwing darts covered with a rust-colored mold. The mold deals no extra damage, but does begin to grow on the flesh of those hit by the darts who fail a saving throw. After the first day, the mold begins dealing 1 point of constitution damage each day as it produces enzymes which begin liquifying the host’s body. When the host is reduced to 0 constitution, he is little more than a pile of mush, upon which several “infant” mold men begin to grow. Once the mold begins to grow, it can only be destroyed with fire or a remove disease spell. The Jamba Highlands are a group of snow-capped mountains and their foothills that rise above the jungle of Cush and the grasslands of Pwenet. The tribesmen believe they are the abode of their gods. This belief is bolstered by the strange, white gorillas that seem to guard the passes that lead through the mountains. The highlands feature a plethora of simians and avians. Old stories claim that the mountains are rich in precious stones and metals, but they are far enough away from civilization that nobody has made a serious attempt to mine them. Pwenet is a land of rolling hills with scattered copses of aromatic trees and a few rocky outcroppings. Large herds of ruminants travel from watering hole to watering hole while being stalked by giant centaurs, lions and even more fantastic predators. Pwenet is said to hold both a fountain of youth and the source of the River Ish, thus making it a popular destination for explorers. A few merchant-adventurers from Ibis travel to Pwenet once a year to trade manufactured goods for aromatic resins, ivory, darkwood and wild animals. Otherwise, the region is untouched by the people of Lemuria and the Motherlands. Though not the most numerous, the giant centaurs of Pwenet are the region’s most prominent folk of the hills. Pwenet is also home to many tribes of gnolls and humans. The largest tribes, human and gnoll both, provide most of the region’s drama as chiefs and witch-doctors jockey for power and recognition. Oft told tales tell of when the tribes of Pwenet united under Jobo the Great and conquered the cities of Nabu. The people of Pwenet believe that history is a cycle and that they will once again conquer the outside world when a great leader united them. CENTAURS: The centaurs of Pwenet look like a cross between humans and giraffes rather than humans and horses. Pwenet’s centaurs are larger and stronger than normal centaurs, but also more calm and level-headed. They carry large shields and pikes. DWARFS: The dwarfs of Pwenet are only distantly related to the dwarfs of Antilia and Thule. They have pitch-black skin and eyes and small beards of wiry, black hair. Like other dwarfs, they dwell under-ground in burrows protected by all manner of traps. The natives of Pwenet call them the utu. The utu have different abilities than other dwarves. Their eyes allow them to see in the brightest light and blackest darkness, including magical darkness. Their skin is as hard as granite and provides them a natural armor class of 14. Utu characters have a +1 bonus to constitution and a -1 penalty to intelligence. The utu carry shields and swords made of darkwood studded with shards of jade. Utu dwarves worship Khnum, the divine potter, creator of the universe. Khnum’s clerics are curious about the universe and spend most of their time recording their observations on clay tablets. Where other dwarfs are expert at the forge, the utu are experts working with wood and clay. Their pottery is valued by the people of Ibis. The utu are learned in the art of conjuring spirits, from whom they obtain most of their knowledge. All non-player character utu clerics can use the spell contact other plane once per month, when the stars are aligned. Once every century a lucky cleric is able to make contact with Khnum himself to deliver a great prophecy to all the peoples of Pwenet. On these occaisions the dwarves sound their drums and blow long horns made from hollowed darkwood trees to call all the tribes to hear the prophecy. All the great chiefs of Pwenet heed this call and travel to the appointed place with their retinues, sworn by tradition to observe a full week of peace while the ceremonial dances are performed, lineages are recited and finally the prophecy is pronounced. The coming of the current princess of the Quiet Folk, avatar of the great earth mother, was pronounced at the last convocation, and the next prophecy is due to come in the very near future. Nice! The Wyvern Coast, Nabu, and the little bit of Pwenet detailed so far are some of my favorite parts of NOD. I can't wait for more African themed hex crawl goodness. If the images were first published in 1935, they unfortunately wouldn't be (or, maybe I should say may not be) in the public domain. Finding the images you're looking for will be a challenge. But it'll be worth it, this is very intriguing stuff. Your amazons, tribesmen and the utu are very interesting and refreshing takes on the matter and the world in general looks like a lot of fun. I'd totally dig it man. It would be a nice change of pace from the vaguely euro-medieval themed fantasy doodles I've been doing lately. I remember Dungeon magazine had a few Africa themed adventures in the late 80's. One with an elephant graveyard was pretty cool and there were some wicked jungle ailments rules. Yeah, just my luck, huh? I bought the pack because it's great, and I do have some more to write about Cush in the future.